Shawn Hood, center, accepts her diploma from Peter Braza, dean, College of Letters, Arts and Science, while Chancellor Venkat Reddy looks on. Marc Pino accepts his diploma from George Reed, dean, School of Public Affairs. 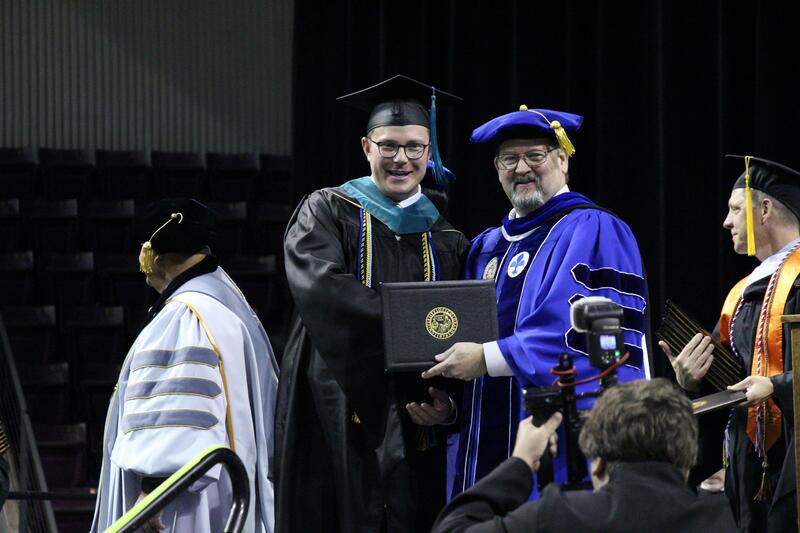 Jerod Heidrick accepts his diploma from George Reed, dean, School of Public Affairs. 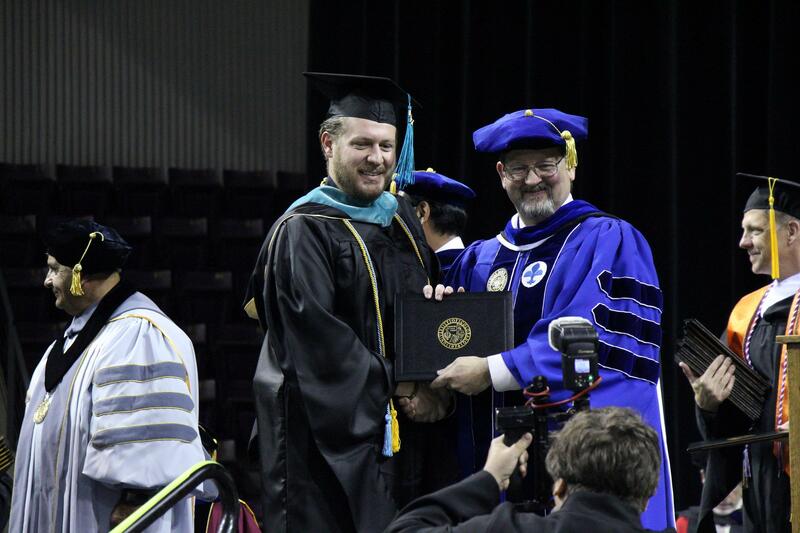 Among the approximately 500 graduates who participated in Dec. 15 commencement ceremonies at the Broadmoor World Arena were three UCCS staff members. Marc Pino, police chief, Department of Public Safety; Jarod Heidrick, police sergeant, Department of Public Safety; and Shawn Hood, office assistant, Chancellor’s Office, each earned degrees. Pino and Heidrick each earned the Master of Public Administration degree. Hood earned a Bachelor of Arts in Sociology. Each took advantage of the university’s tuition benefit available to employees and their dependents. For more information, visit the tuition benefit website. 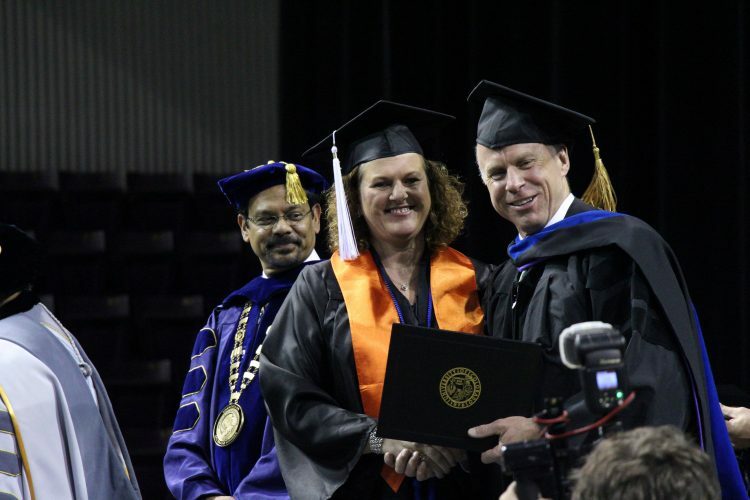 CU President Bruce Benson, members of the CU Board of Regents, UCCS leaders and 14 members of the class of 1992 joined in congratulating the graduates and formally conferred degrees for students who completed requirements for bachelor’s, master’s or doctoral degrees in August or December. Linda Hogan, a member of the UCCS class of 1973, and CU Boulder professor emerita, will delivered the commencement address.